You can find Judith here and here on Ravelry. Like most people who create and make things, I find inspiration absolutely everywhere. In the forest, on the beach, and in the mountains; in museums, on city streets, and in my neighbor's garden; the world is full of colors and shapes, and the ones that move me can spawn an idea. I once designed a necklace with colors I'd never have put together if it weren't for the photograph of an Art Nouveau mural I saw. 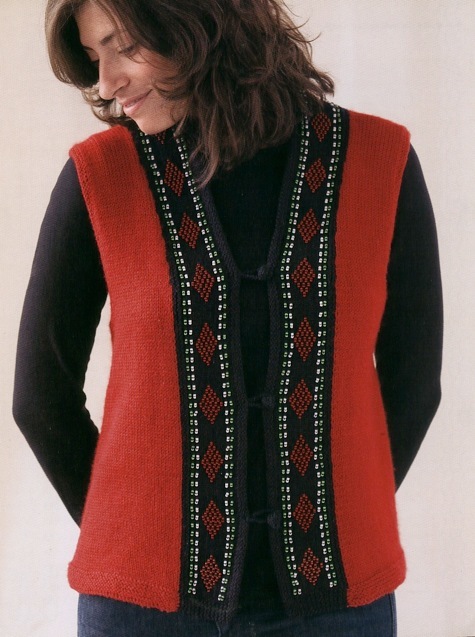 And the colors and patterns of Zulu bead work was the impetus for the Zulu Inspired Vest pictured here. All of them. Well, maybe not all, but I love cables, color stranding, lace, knitting with beads; I make socks, scarves, hats, sweaters, pillows…too many things to list! I think this question would be easier to answer in the negative: I don't particularly enjoy intarsia, but I do love what can be done with it. I've managed to complete a couple of intarsia projects, but I find that I'm not happy working with too many strands of yarn that aren’t staying with me from the beginning to the end of a row or round--I always have to stop and untangle the mess I've made. Perhaps I'll give it another go one day, but in the meantime I have plenty of knitting that I love to keep me busy. I find that there's a direct correlation between my food and drink intake and my size, and I've been all sizes between 8 and 16 several times in my life. Oh, but I suppose you're asking about the sizes I write patterns for. The range I choose is dependent on the design. When I started teaching from my book Knit One, Bead Too I needed something special to wear, something that could transcend the seasons. 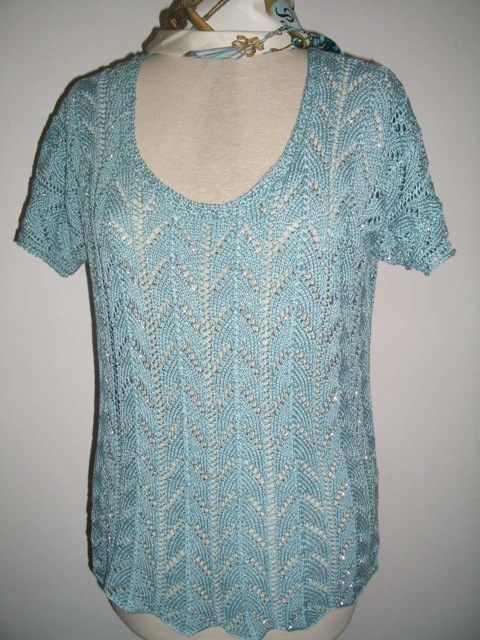 I came up with this simple beaded horseshoe lace top. I wear it over white in the summer and over black in the winter. Beaded Shell, to be published by Kollage Yarns date not available. The simple T-shirt shape is flattering to almost every figure, so when I sold the design to Kollage Yarns knitted in their absolutely delicious Creamy yarn, I wrote the pattern in 4-inch increments from 34 to 54. The original, shown on the dress form, is 46 inches, and the new version for Kollage measures 34 inches. Yes I do look at other designers' work, and I do allow myself to be influenced. If I'd never seen Vivian Høxbro’s work with Domino Knitting, I never would have known to design this great bag or to embark on what may be a 10-year project knitting a mitered queen-size bed cover with 16-inch overhangs! And while I would never promote the idea of copying anyone else's design, it's not a bad thing to learn from what others are doing. I would love to think that something I've done inspired someone else's original design. 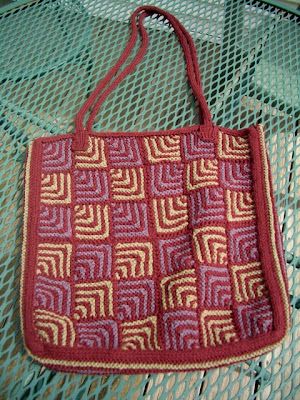 This is a project Judith uses for teaching classes. The Bed Cover, is a personal project from Judith and is not published. How do you feel about the controversy of the so-called "dumbing down" patterns for knitters? This is an interesting question for me because I've been on many sides of the knitting world. 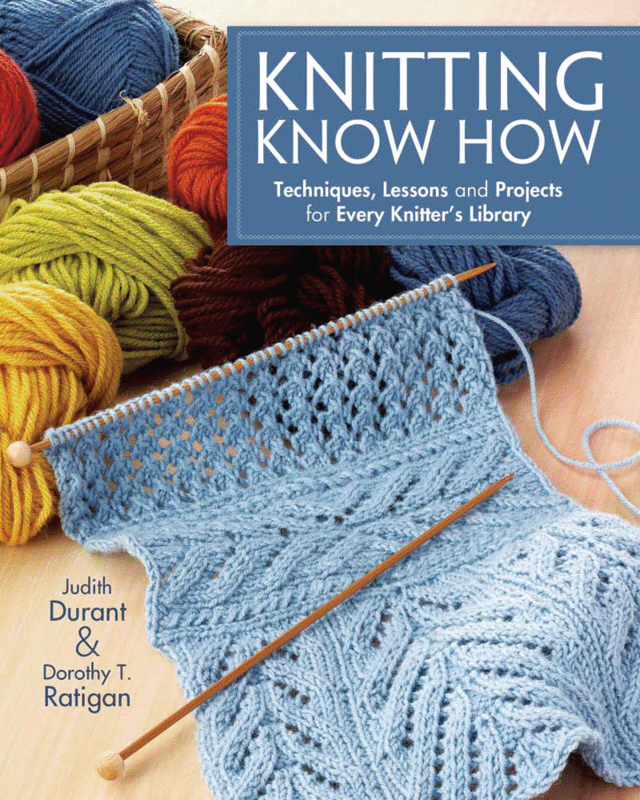 When I was a beginning knitter, patterns were written in a very terse way, and you could find little extra help--it was assumed that if you were following a pattern, you already knew enough to knit it. I had to look for help beyond the pattern, and I was fortunate enough to find the answers with my mother or grandmother; I also managed to figure out a few things for myself. As a pattern writer and editor, I've often groaned aloud about the seemingly excruciating detail I'm required to include with some instructions, feeling as if I have to hold the knitter's hand from beginning to end. 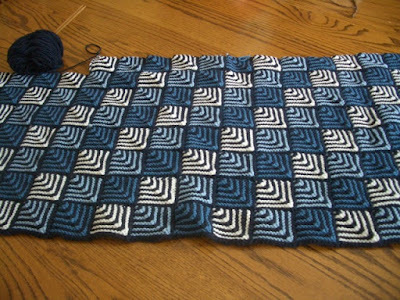 However, as a teacher, when a student comes to me with a problem with someone else's pattern and there are no clues readily available in the pattern to help answer the question, it can be frustrating to have to start at the beginning and mentally knit the better part of a sweater to find the answer. 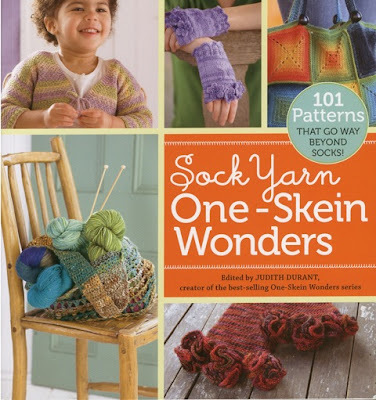 As the editor of the One-Skein Wonders series, I personally answer every question that comes in on the patterns in those books. The first four books of the series comprise 404 patterns, and there are two more books currently in the works: 101 Crochet One-Skein Wonders and 101 Lace One-Skein Wonders, bringing the total to 606. With that many patterns to be responsible for, the fewer the questions the better. 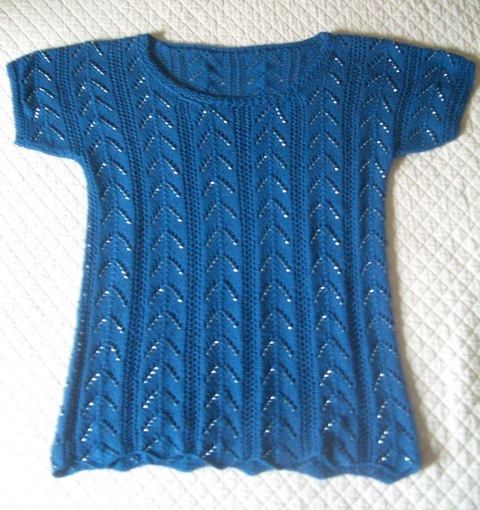 At the moment I don’t do enough designing that I need test knitters. What you see is what I knit. I wish I could say yes to this question, but my only business plan was to find a way to get off the commuter rail. The Internet has helped many designers get more exposure and sell their designs. I'm still a bit of a technical dinosaur, and it's a wonder I have any Internet presence at all. However, I do have a New Year's resolution, and that is to hire someone to create a professional website for me and to start to use more of the social networking tools that are currently available. All of this creates a bit of a problem for me because I'm a very private person by nature. It goes against everything I've been taught and everything I believe to go shouting to the world how great I am. But like many things in life, it will probably be okay if practiced in moderation. Everyone needs a technical editor. Since most of my designs have been published in book form, a technical edit is part of the routine. When I edit or project manage the publication of knitting books and patterns, I always use a tech editor. I've designed several projects that I use to teach specific techniques, and I had the instructions tech edited before I used them in class, even though I may have already knitted from them more than once. It is a strange phenomenon in knitting--no matter how many trained eyes look at a set of instructions, some errors sneak past us. He drives, I knit. It's true that when work is such a big part of one's life the lines are blurred. My work is a mix of designing, writing, and editing, and for the most part I try to do these things during the day while my husband is off at his job. 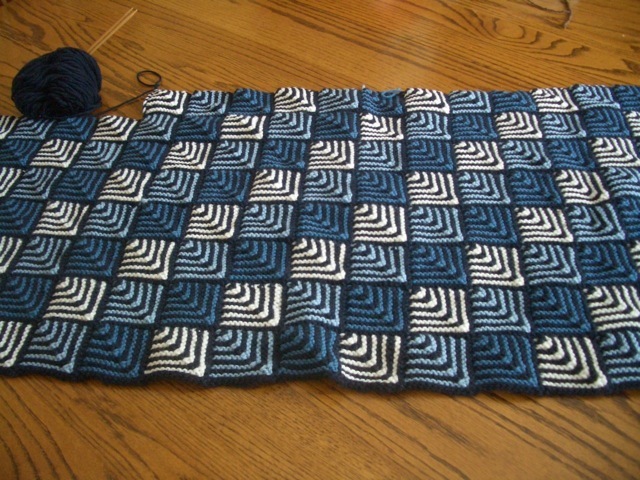 The knitting that goes along with my projects is usually done in the evenings and on weekends--sometimes I'm knitting for work, other times I'm knitting a personal project. No matter what it is, knitting is always a pleasure for me. 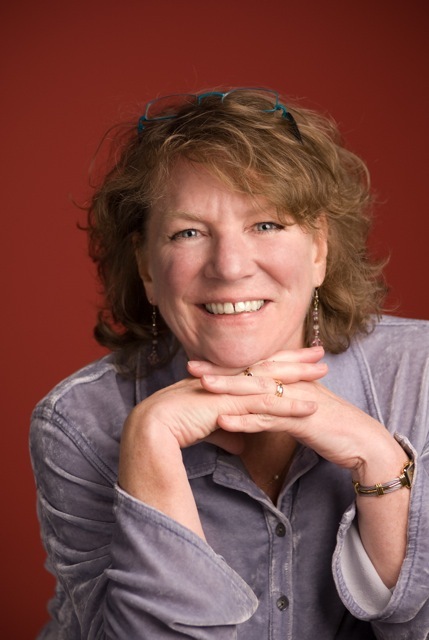 I've developed a somewhat thick skin over the years, and it all began while I was in college. As theater students, part of our learning experience was analyzing and giving critiques of others' work. We'd listen to an actor perform a monologue or sit through a costume or set designer’s presentation; when they were finished, we had to say what we thought of what we saw, good or bad. Sometimes it was easier to hear harsh criticism of my work than to tell others to their faces that I thought their work was boring or insincere. But because the critiques were shared among a group of piers, we could usually turn the negatives into a learning experience to be used in the future. These days, anyone can say whatever they want and be heard by a very wide audience on the Internet. What bugs me is that none of these comments are edited, and sometimes they are just plain wrong. I've watched some threads that are downright nasty--to me it's the equivalent of the bullying that goes on in elementary and middle schools. When my work is criticized, I first consider the source. Then I either agree or disagree, learn from it or not. No matter where it comes from, condemnation stings; but I try never to take it personally. I believe in what I'm doing, so I let the sting subside and move on. Ha! I'm still waiting for that day to arrive. I am very fortunate to have a loving and supportive husband who also has a job--without that I would not have a career in knitting. Some years are better than others, but I often say that what I make in a year wouldn't keep a skunk alive. I do think I could make more money, but it would require more marketing, and this leads back to my personal problem, discussed above in answer to the question of what impact the Internet has had on my work. I do have plans for spiffing up my website and selling more patterns. I'd also like to do more teaching, but this unfortunately takes away weekend time that I want to spend with my husband, riding our motorcycles or getting together with friends. I believe I could support myself with my knitting and editing, but I would need to dedicate more time to it than I currently do. I would give the same advice that my mother gave me when I wanted to pursue a career in theater. "Don't listen to those who say you can't." If you're lucky enough to have found something you love, let your passion drive you forward.